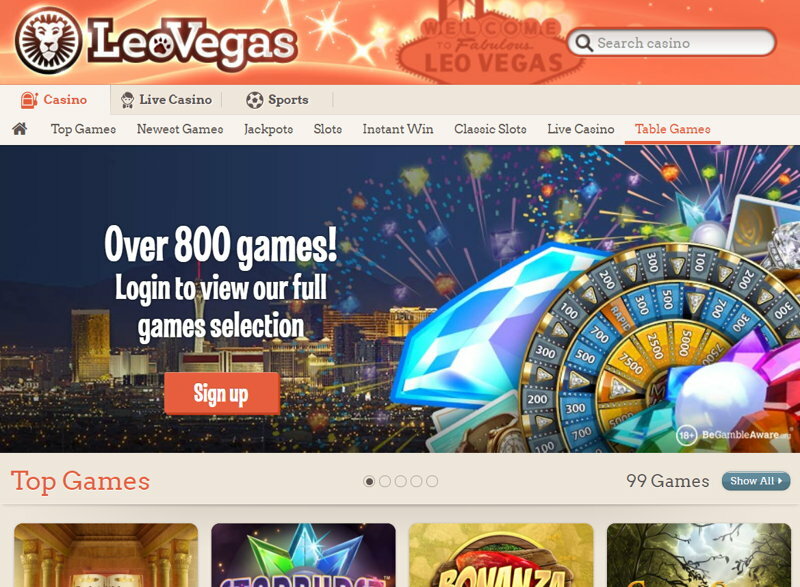 LeoVegas is an exciting new brand in the online casino industry. The company have only been about since 2013 but in that time have already had recognition from the gambling industry winning awards at the EGR Innovation Awards and the GIQ Gaming intelligence Publication. For a ‘new’ site, this is an excellent start for the business and it’s really a sign of things to come. The company have seen massive improvement since the site was first launched as well, bringing in new games on a weekly basis and keeping aspects such as their promotions fresh and appealing for both new and existing customers. What you’re going to find from the casino is that you can play via their instant play browser based format or on your mobile, simply by hitting up the site in your browser and being re-directed (no official download from any app store is currently available). The sportsbook is still very much in its ascendency but you will be getting a good range of both sports and markets to bet on. There are 3 main aspects to their sportsbook at the minute and that’s their live betting, their football section and their mobile betting app. The live betting is where the majority of action takes place on site and is often a hive of activity. They turn the majority of their markets live and clearly have targeted this sector of the industry as one they want to pursue. Football is where you’re going to find the most action, and bets within this section are plentiful. Whilst there are many, many other sports and markets to wager on, football has them all well beaten, in terms of depth at least. Finally, their mobile betting app has been a welcomed addition to the sportsbook and we must say it’s a real pleasure to use. There is no download specific version of this, but all you really need to do is visits the site via your mobile browser and you will be forwarded to the mobile friendly version instantly. 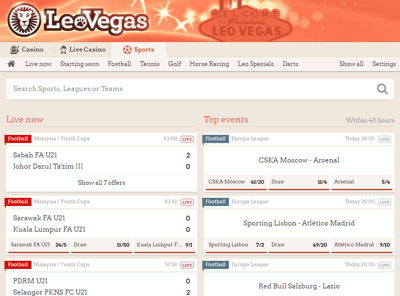 LeoVegas use a staggering 14 different software providers for their games section, which includes NetEnt, Microgaming, Viaden, Play n’ GO, NextGen, IGT, WMS, BetSoft, Cryptologic, ELK, iGaming2Go, Nektan, iSoftBet and Bally Technologies. This means they can individually select the best games from each and provide a cracking user experience from within the casino. The slots section is pretty phenomenal with over 400 titles to choose from. What we really liked is that they don’t leave games to stagnate just for the sake of having a larger catalogue on offer. Often games that aren’t being used or aren’t as popular will get culled, then they dive into their extensive range of slots to choose from before selecting new one. 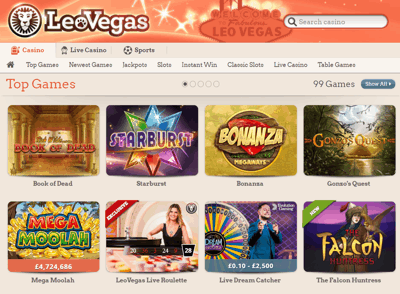 Whilst the slots section is undoubtedly the main attraction for most at LeoVegas, don’t discount the table games that they have on offer as well. They have in excess of 40 to choose from with tons of variants of both blackjack and roulette. On top of that you can play live casino, jackpot games and even classic slots, which are actually a blast and a real nostalgia trip of online slots used to be!